I met Sally last year, in the middle of a tornado warning. She was doing some modeling for a photoshoot and I was immediately struck by her natural beauty and kindness. Fast forward to earlier this year to when Sally reached out to me to do flowers for her wedding to Martin (Hugh Jackman's younger twin brother!). 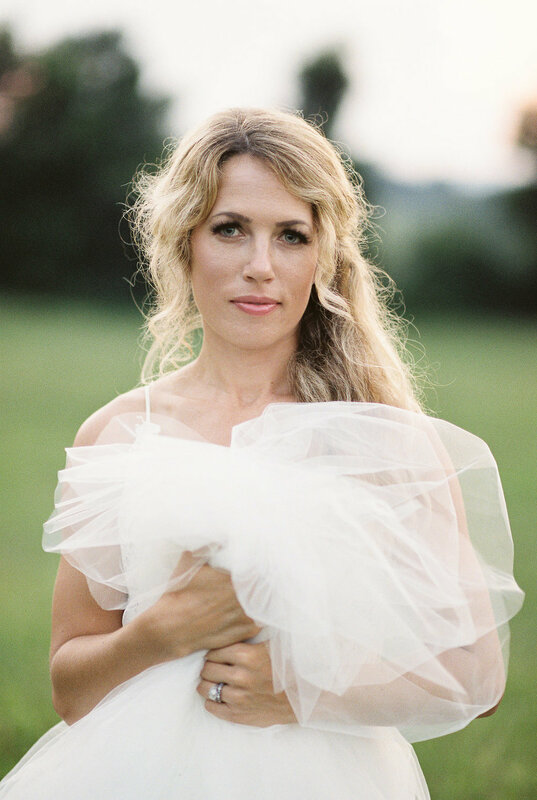 The wedding was held at her family's farm by the most idyllic pond nestled in the rolling hills of Virginia Hunt Country. On the edge of the pond was the most perfect ruin of a stone house. Of course I immediately tried to convince Sally that her guests didn't need to eat and drink - all of her resources should be spent on flowering the stone house and sail cloth tent. She laughed and talked me down from my floral fantasy. Their wedding day went off without a hitch and the flowers were a celebration of local blooms in wooden boxes on bare farm tables. Soon after the wedding, Sally and Martin decided to do a relaxed wedding session with my good friend and collaborator Krysta Norman. This time, it was just the four of us on a friend's farm just outside of Middleburg, VA. When I say four, I mean four of us with two legs and one with four legs - the most beautiful palomino joined in. By sunset, I was ready to take that beautiful horse home with me and pick up where my riding lessons ended when I was eight years old. The light was perfect and as we were getting started, I was thrilled to see Krysta put her digital camera away and shoot entirely in film. The results are soft, romantic and leave you wanting more from this delightful couple.